This page is about the American twin-engine fighter P-38K. For other uses, see P-38 (Family). The IV is a gift Rank IV American twin-engine fighter with a battle rating of 5.3 (AB/RB/SB). 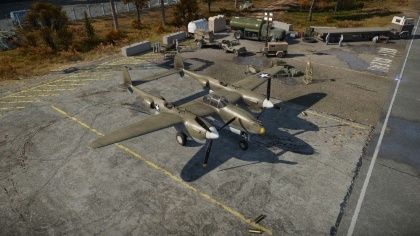 It was introduced during Update 1.53 "Firestorm" when it became available as part of a Christmas Sale Bundle in 2015, and again in the 2017 Summer Sale in the "Daredevil" bundle. The main and only tactic of the P-38K is, solely an air superiority and it excels at that. 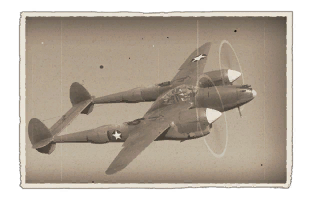 When playing the P-38K, climb to a high altitude, search for the enemy and locate an enemy you feel confident in engaging. Assuming you are above the enemy target, put the aircraft into a gradual descent, which allows you to maintain a speed advantage. As you are descending; make small corrections on your path so you don't give the element surprise away by overshooting the enemy. Now you are about one to two seconds away from your target. Here you will line your sights up, with your sights on the tail and fire a bust with your cannon and machine guns. While keeping the momentum, climb back up to the height you where before and repeat for the best results. This plane does not carry any bombs or rockets. So using this in a ground strike role is not recommended. No surviving P-38K aircraft exist. It was available as part of a Christmas Sale Bundle in 2015. then again in the 2017 Summer Sale in the "Daredevil" bundle. This page was last edited on 23 March 2019, at 14:30.